By Jim Purpura. Posted July 24, 2011, 11:23 AM. 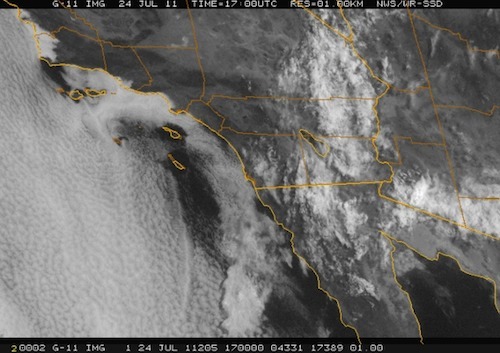 A surge of monsoonal moisture is heading from the Gulf of California into Imperial County, eastern San Diego and eastern Riverside Counties this morning. This morning's visible satellite shows cloud cover associated with the moisture. A recent analysis from the Storm Prediction Center shows this moisture surge underway. Most likely areas for storms will be mountains and deserts. Doppler Radar and morning soundings show winds aloft are light and from the southeast. This wind profile indicates the storms will probably not move off the mountains into the Inland Empire this afternoon.